Loggerhead sea turtle nesting season officially starts on May 15th on our beaches, and it looks like the turtles got the memo. 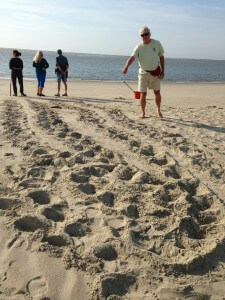 On our second day walking, George Hilton found a set of tracks on the North End of the island. Because the turtle came ashore without nesting, we call it a “false crawl.” Gary and Lesa investigated and concurred with George’s assessment of the situation. Yesterday was my turn to walk the beach, and I faithfully walked the high tide line the way we are supposed to. I stopped to investigate some canine tracks on the beach and looked out to sea, and saw a curious thing… sea turtle tracks on the sandbar. These, however, went only ONE WAY! They didn’t come up onto the beach, so I wasn’t expecting to find a turtle actually nesting, but I was curious about a single set of tracks. We investigated, and found that the tracks were indeed “incoming.” Skeptically, we looked at the tide pool, which goes the length of the beach southward, and is riddled with old tree stumps and twists and turns. We couldn’t imagine a turtle could be hiding in there, but we did investigate. Eventually we came to the conclusion that she changed her mind and swam out of the tidepool southward. Want to help with the turtle team? Click here for the protocol page, or click the Turtles tab at the top of this page. Just want to keep up? Our nestlog page will have the ongoing information about what we find. Here’s a step by step guide to using sign-up genius to schedule a chance to walk.